Make the most of your small living room with these design ideas including everything from coming up with inventive storage solutions, to using mirrors to increase the sense of space, to kitty-cornering, backless sofas, and more. But, if you’ve been trying to design a small living room that you feel great about, you already know that! You’ve tried rearranging the furniture, putting a mirror here or over there, and everything else under the sun to get a design that’s just right… Still, though, it never quite lives up to what you’d hoped for. That’s why we’ve put this guide together. Here, we’re going to share 44 tremendous examples of small living room designs, each of which can offer you some degree of inspiration. As you’ll see, there are so many things you can do to maximize and beautify your design. 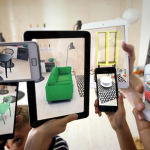 From coming up with inventive storage solutions, to using mirrors to increase the sense of space, to kitty-cornering, backless sofas, and everything in between, we’ve got it covered! So, if you’re trying to find design ideas for your small living room space, then take a look at these examples. We think that by the time you get to the end, you’ll have a much better grasp on what’s involved and what’s possible. Who knows? Maybe you’ll find yourself glad you have a small living room instead of one of those larger, more unwieldy spaces! 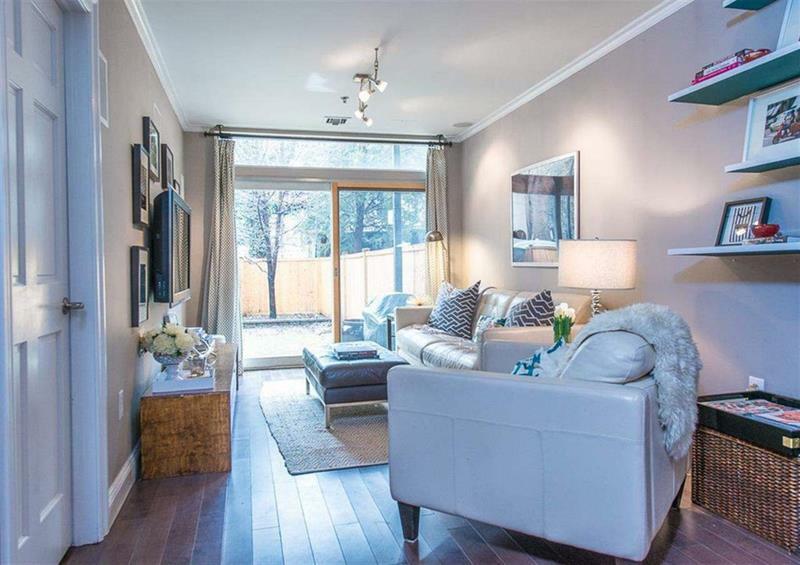 Based in an open-concept home, this living room makes excellent use of the space allotted to it. 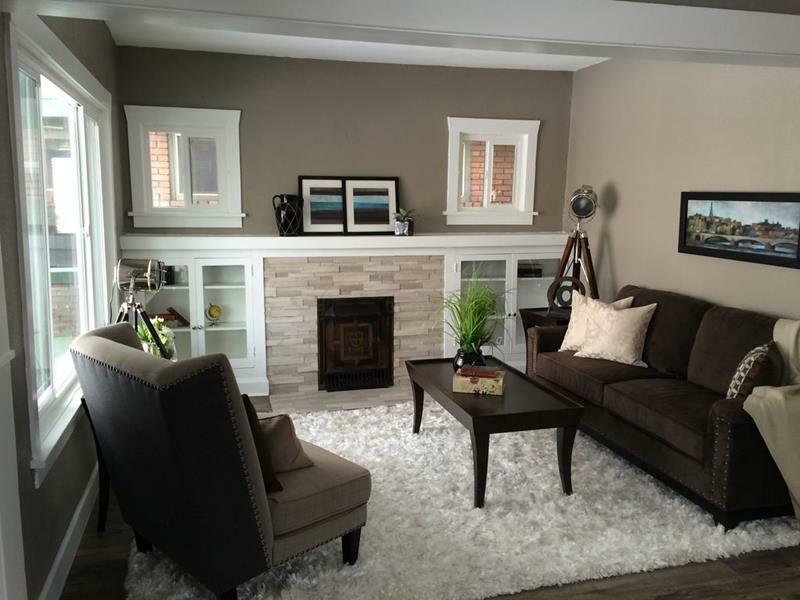 The grey plush area rug adds a sense of comfort that might otherwise be lacking given the open concept. Best of all, though, the L-shaped couch ensures that everyone has a comfortable place to sit! Worth noting also is the house plant in the corner, which adds just the right level of charm. To be sure, this design isn’t going to appeal to everyone. 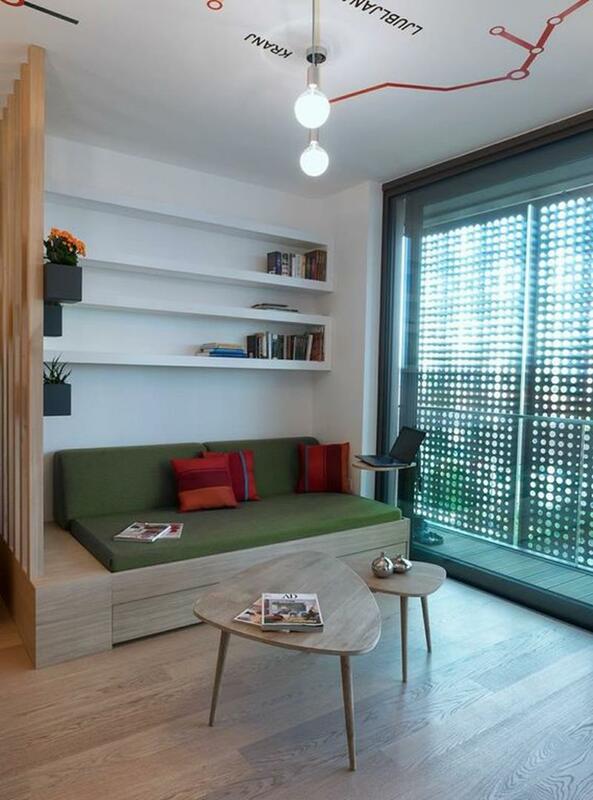 However, it is a desing that proves that small doesn’t need to mean bold with respect to your living room. 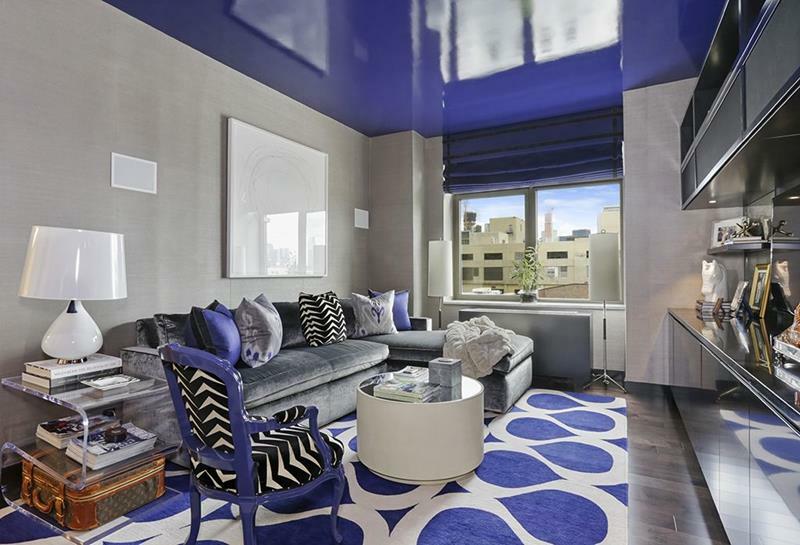 The area rug has been selected to complement the bold blue and reflective ceiling overhead. Even if you don’t like that color scheme, though, there’s no denying the convenience of the built-in cabinets at right. 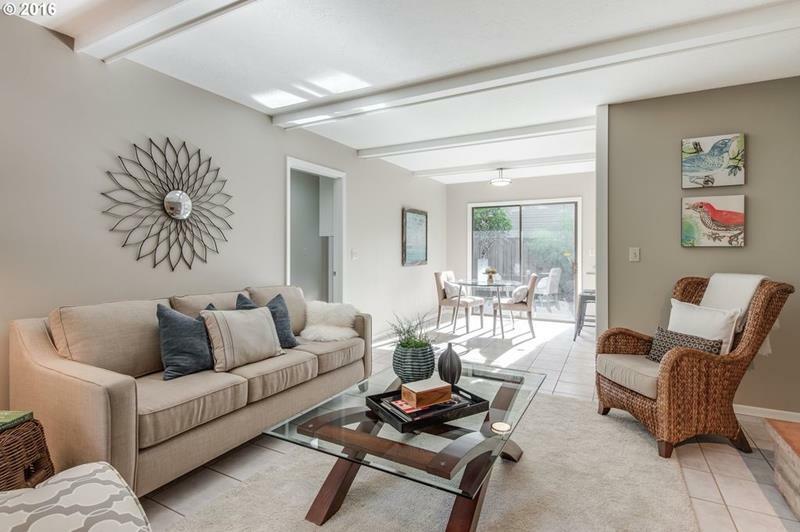 With a large and open floor plan, it’s up to you how large or small you living room is. In this example, you can see that furniture has been kept to a minimum in order to capture that intimate small living room vibe. 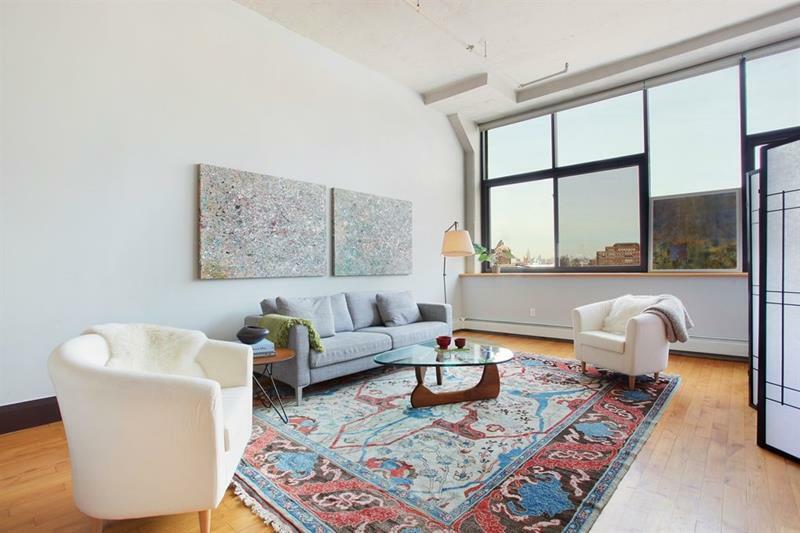 However, the large oriental rug helps to create a sense of color in the space, while the furniture arrangement ensures that the living room feels open and airy. 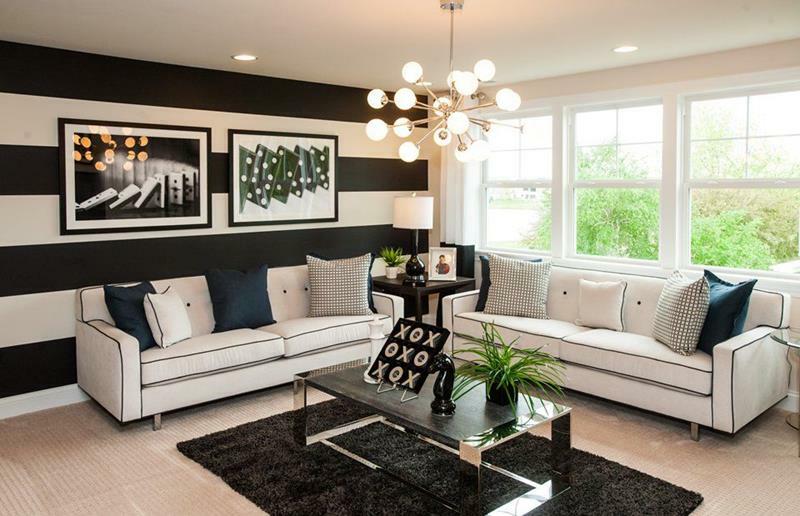 When you’re looking for a color scheme that’s going to ooze luxury and refinement, you’ve got to go with black and white. This small living room demonstrates this perfectly! The centerpiece is obviously the white marble fireplace, with everything flowing from there. Using black couches with white end chairs with black accents creates a lovely level of visual contrast for this design. 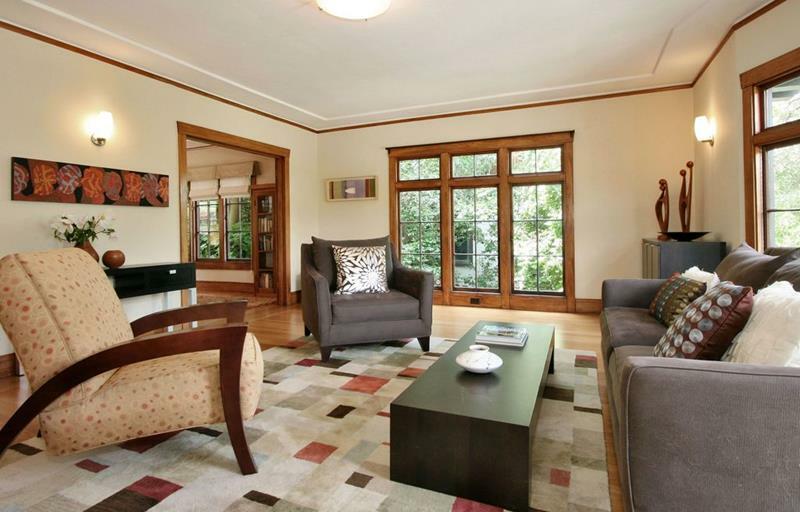 There’s no mistaking the beauty of the Craftsman styling of this small living room space. 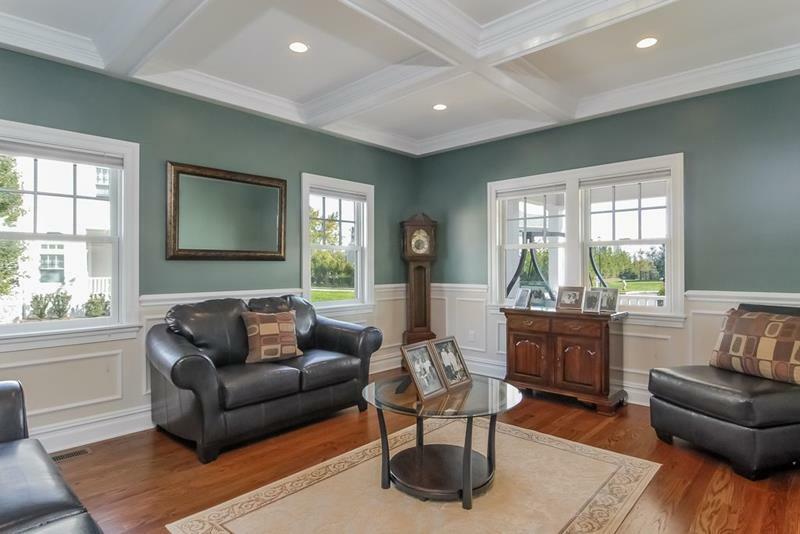 Rather than going standard Craftsman, though, this living room makes interesting choices with its furniture and décor. First, the floor-to-ceiling windows are left uncovered. 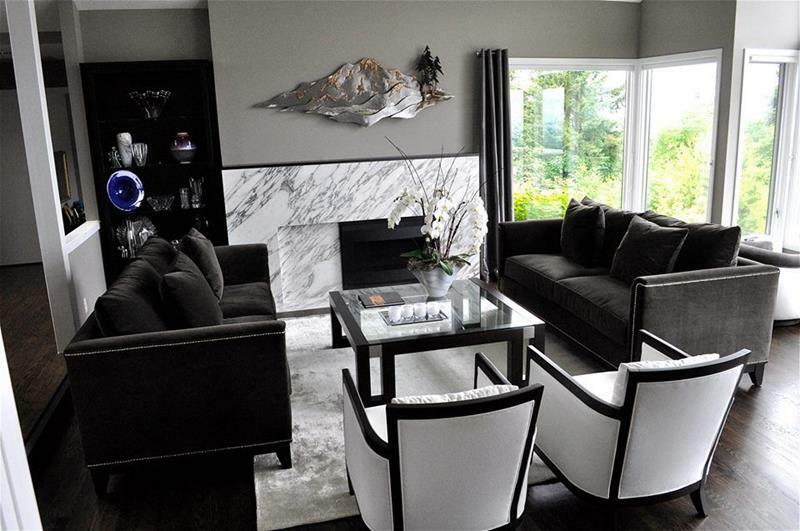 Second, one accent chair with Art-Deco lines adds some great contrast to the design. Finally, everything’s anchored by the couch and coffee table, which have a decidedly modern feel. Within this open-concept home, the small living room needed to find a way to truly distinguish itself. 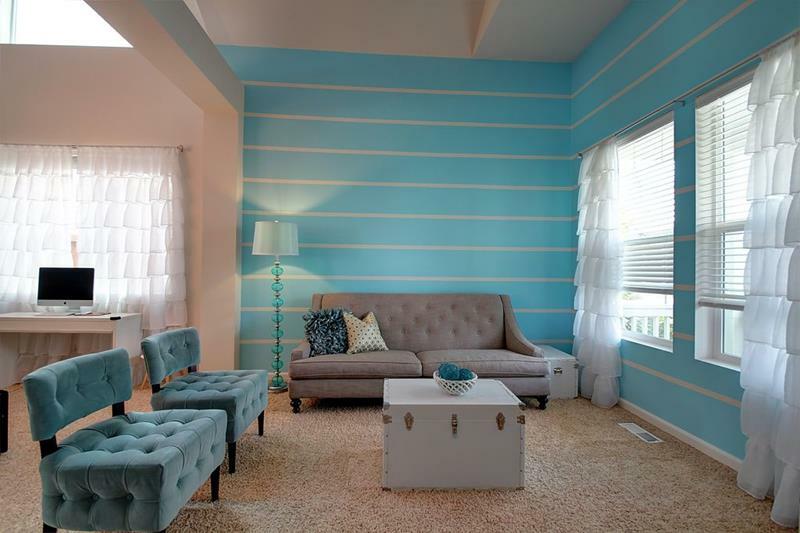 This was accomplished by the walls, which feature a blue and cream striped pattern. As a choice, this perfectly complements the wall-to-wall carpeting, and the whole look is completed by the color choices for the couch and chairs. Preserving openness, a small crate serves as the living room’s coffee table. 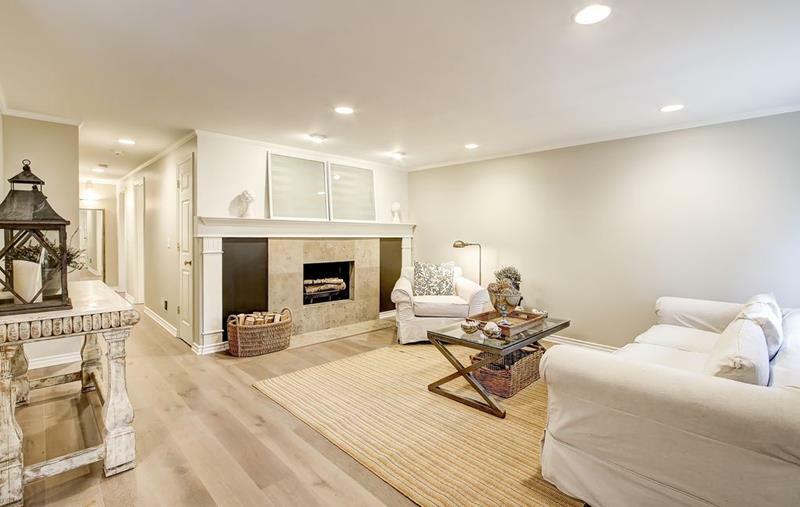 In a smaller home, you may need to use a space like a finished basement to build out the small living room that you want. This example does a great job! 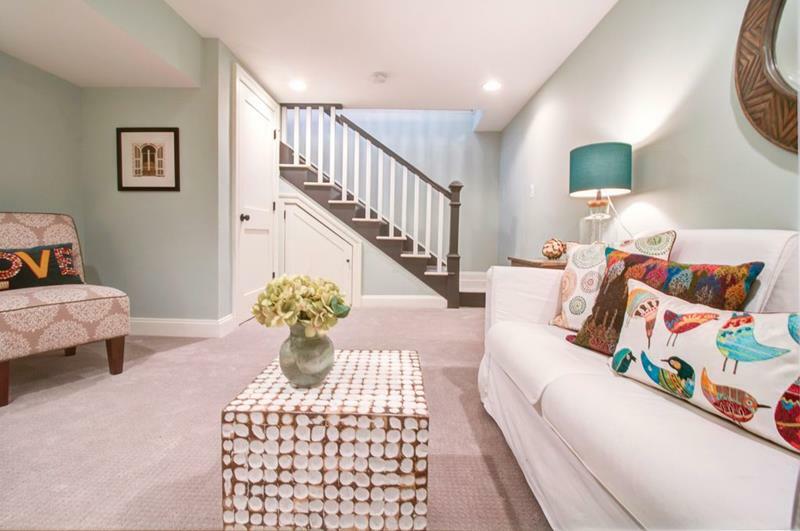 Bright colors help to keep the basement space feeling alive and airy. Of particular note, is the interesting coffee table, which serves as a focal point for the space. Also note how the lack of clutter helps to make this space feel warm and inviting. Everyone loves open-concept homes these days, but they do present unique design challenges. 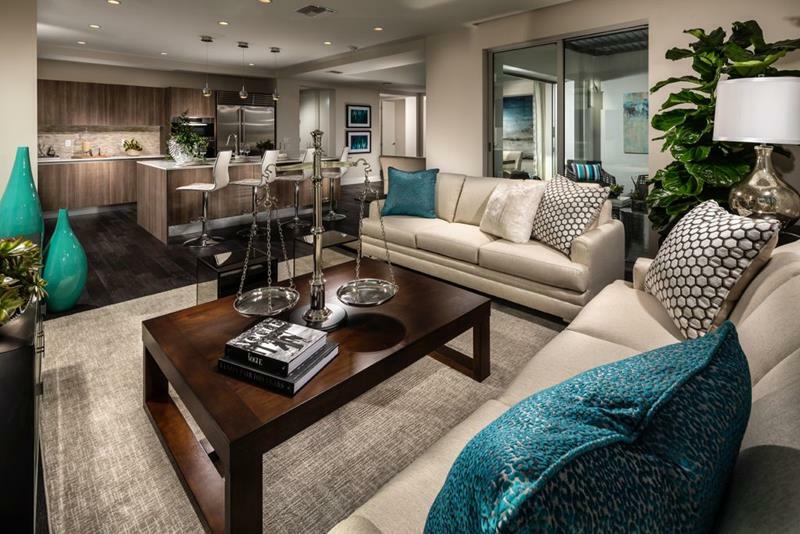 For example, an open concept can make it difficult to create a living room space that truly feels like its own space. Here, you can see how an L-shaped couch creates a wonderful degree of separation. Note also how the area rug for the living room mirrors the colors that are found elsewhere in the space. This is visual harmony in action. If you’re looking for a living room design that creates a sense of intimacy and promotes conversation, then pay attention this example. With a simple and large square coffee table forming the center, comfortable and plush furniture surrounds on all sides. To add visual contrast, a circular light fixture hangs overhead, breaking up the boxy design of the space elsewhere. 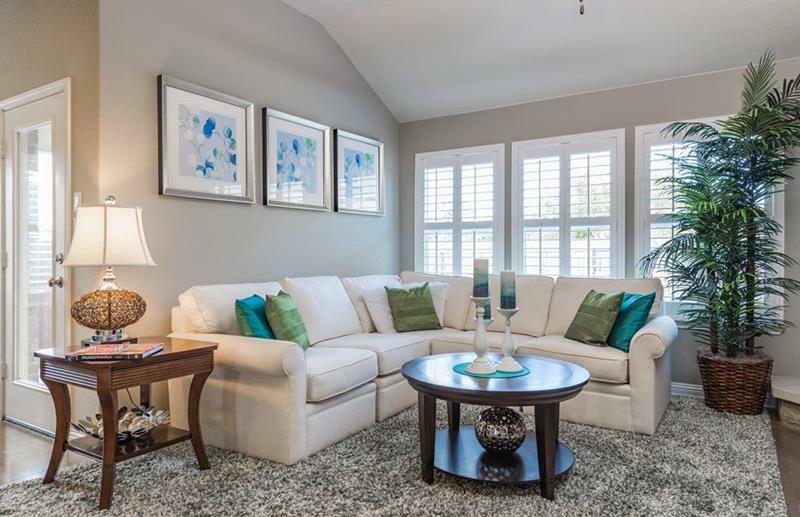 Coastal styling is a very attractive option for those that want living rooms that feel bright and inviting. With tile flooring, a simple area rug adds a level of comfort. 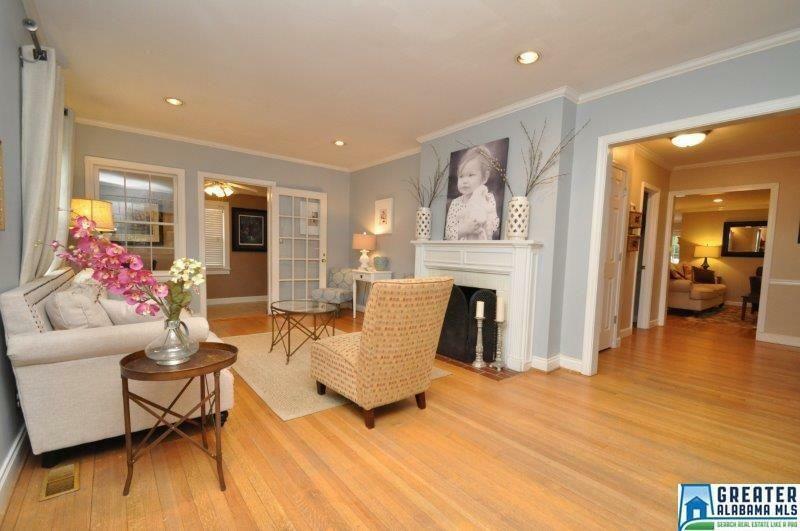 But, the real standout of the design is the wicker chair, which sits flanking the mantle of the fireplace at right. To preserve the sense of openness for this design, the glass-top coffee table is absolutely the perfect choice. As mentioned before, mirrors are an incredible thing. 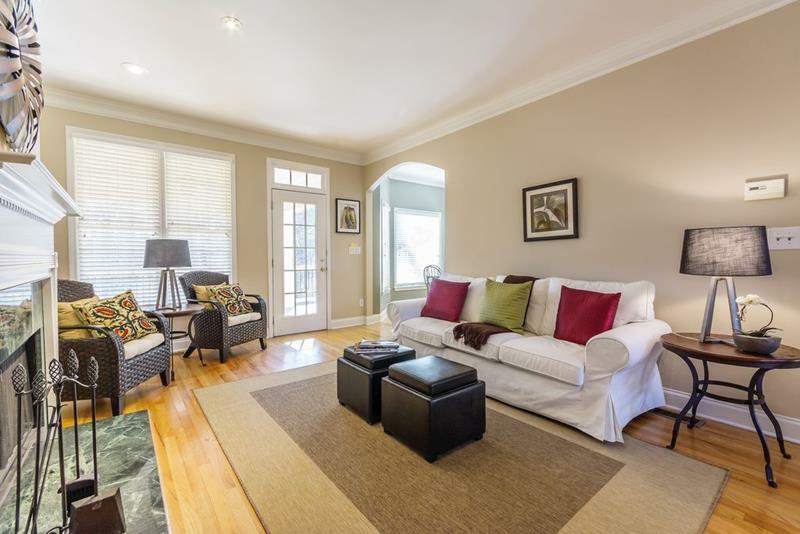 In a small living room, for example, they can really help to make a space feel much grander than it is. This is perfectly displayed in the example above, which features a large leaning mirror at right. Most notably, though, pay attention to the symmetrical arrangement of the furniture and décor here. Such an arrangement is almost always visually appealing. 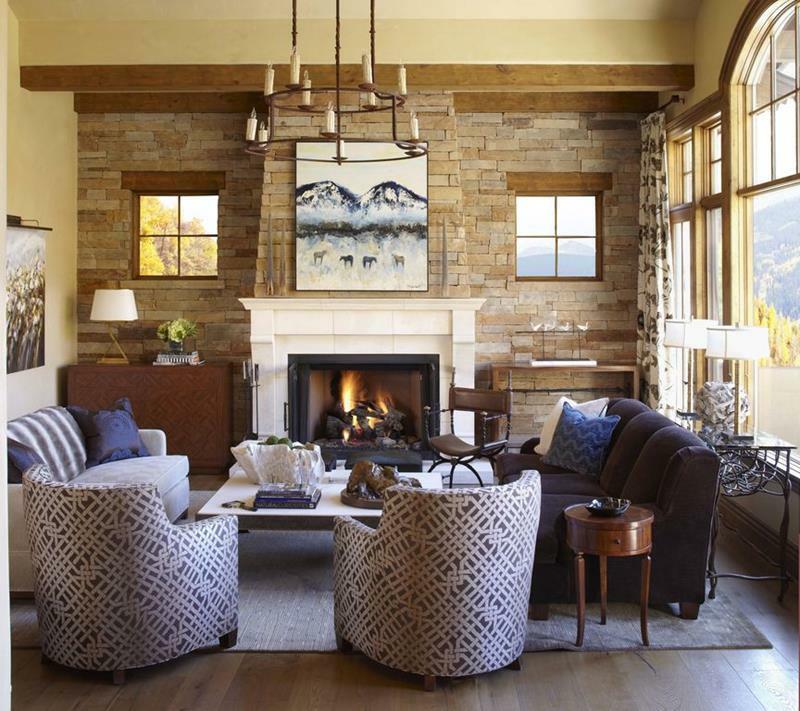 The overall design of this living room does a wonderful job of giving a contemporary spin to Craftsman design. What’s really great here is that picture window at the back of the living room. One can easily imagine sitting on the couch, enjoying the roaring fire, and watching the snowfall outside. 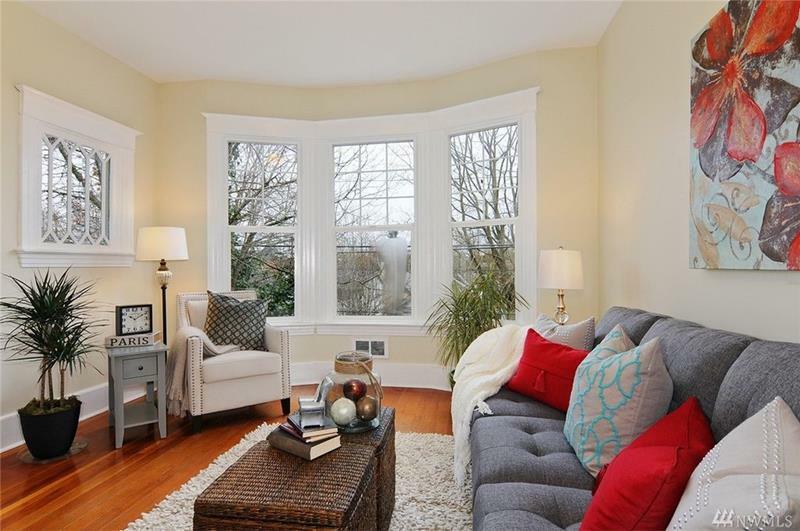 You might think that because of the window the couch should be in the foreground, but consider how doing this would make the space feel unbalanced. It doesn’t matter how small or large your living room is. When you’re designing, you want to think about how you’re actually going to use the space. Here, the choice is clearly to enjoy the fireplace. To accomplish this, the furniture is arranged so that it flanks the fireplace. With this kind of arrangement, everyone in the living room can enjoy the warmth, all while at the same time facing one another so that conversation can happen. 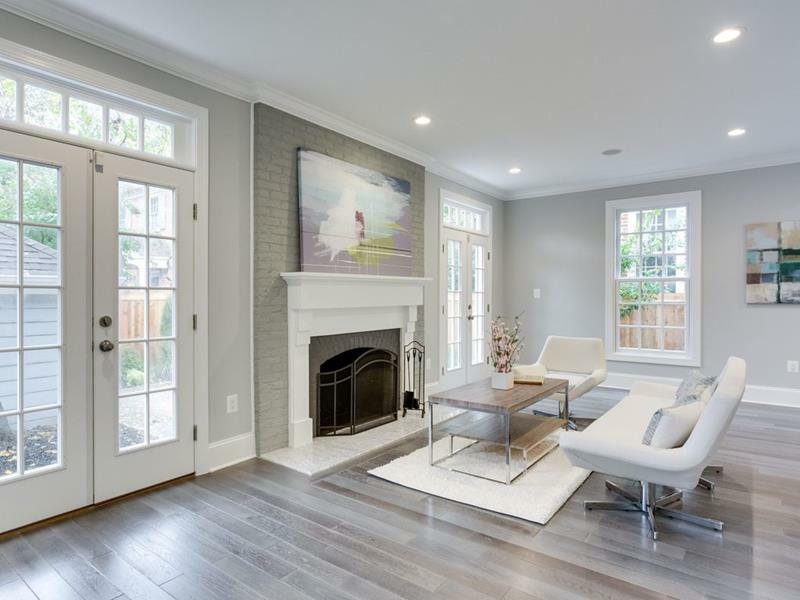 Dark hardwood floors, especially when combined with white walls, create an attractive vibe for any space. Of course, the “contrast level” can be a bit too high. This small living room design finds a happy medium. 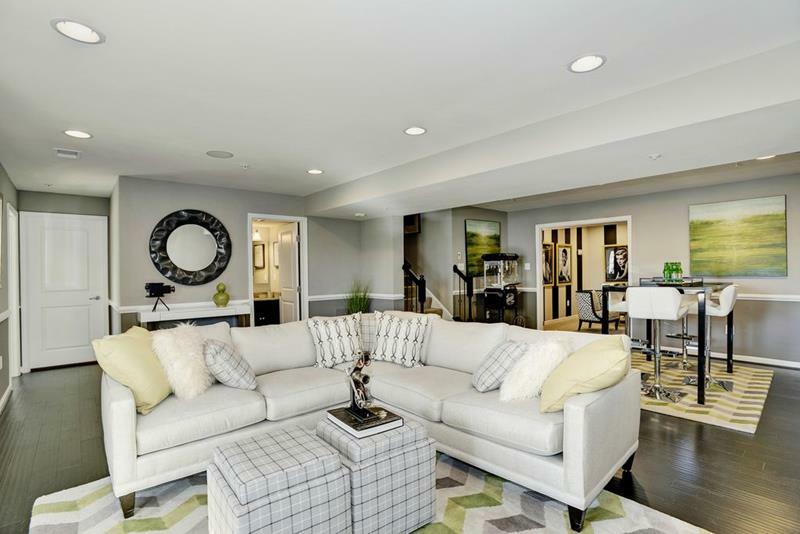 A cream-colored area rug mitigates the stark effect of the dark hardwood floors, while black and white throw pillows on the white couch help to ensure that the effect isn’t completely lost. With limited space to work with, this living room includes a beautiful built-in cabinet feature along one wall. From there, the whole living room design knows where its focus is. In order to complement the reclaimed wood backing of the shelves, the furniture features ample greys, blues and greens. Of note is also the inventive storage space for ottomans underneath the built-in shelves. If you want a small living room that feels relaxed and comfortable, you’d definitely like to consider a brown and cream color scheme. 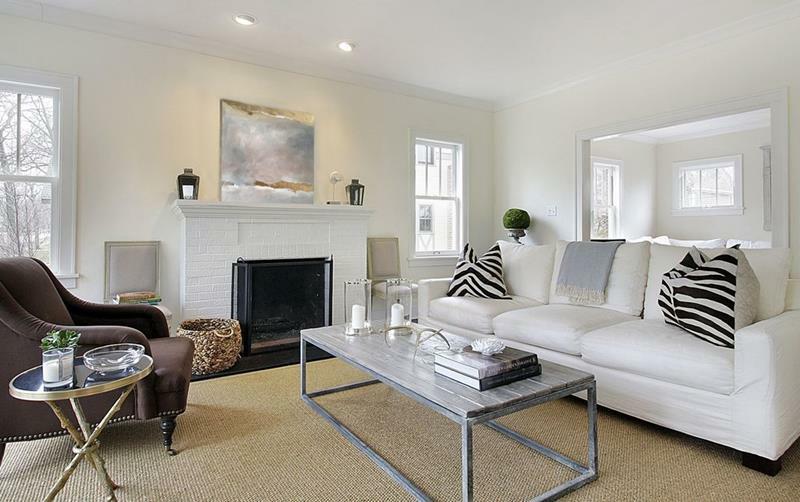 That’s exactly what you see here, with the cream-colored couch featuring brown and white throw pillows. 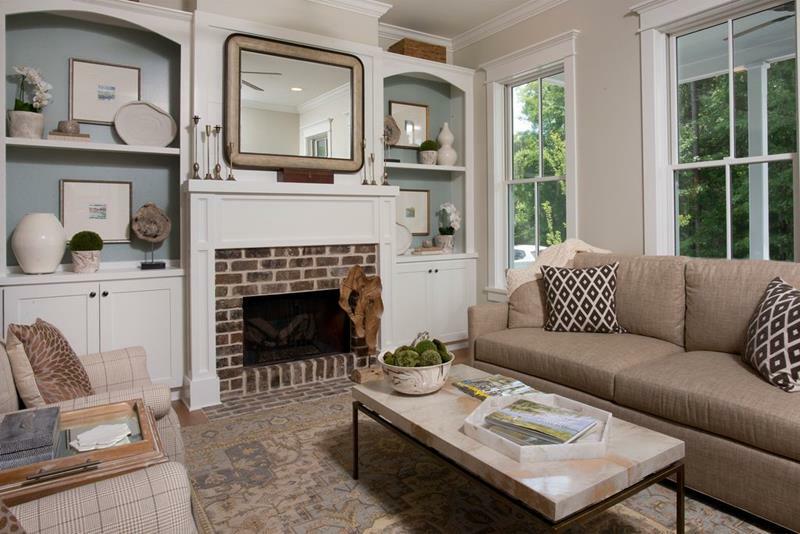 This color scheme is doubly great for this living room thanks to the brick fireplace that’s flanked by a Craftsman-style built-in shelving system. 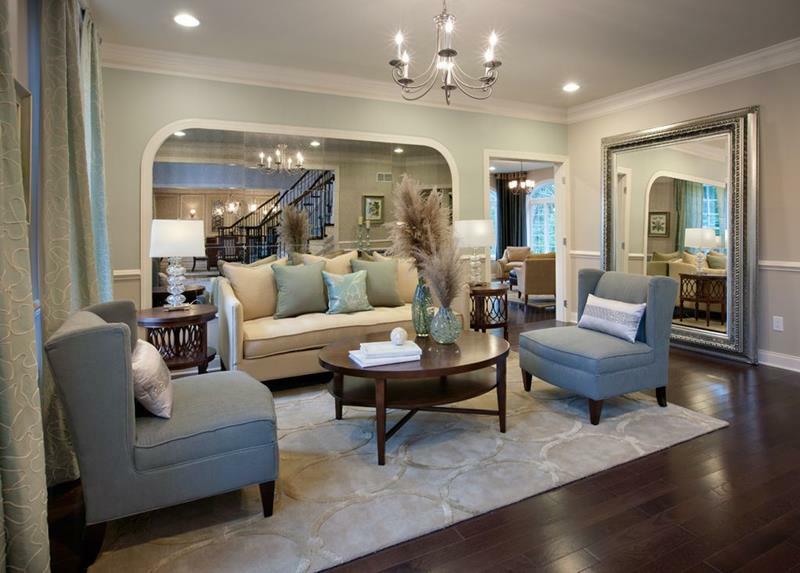 The mirror over the fireplace is just the icing on top! While some folks want their living rooms to be for entertaining friends and family, others want living rooms that are meant for personal entertainment. Here’s a design that’s perfect for the latter camp. A large L-shaped couch with a chaise lounge edge ensures that everyone can be comfortable while watching Netflix. Check out how the black ottoman is actually incorporated into the space thanks to the entertainment center itself and the black television. Obviously, when you’re designing for a small space, you want to preserve as much floor space as possible. Here’s an example of a small living room design that does just that. This is accomplished by aligning all of the furniture around the periphery of the room. Keep in mind as you look at this, though, how none of the furniture blocks any of the windows. Arranging in this manner ensures that the space doesn’t feel too “encircled”. 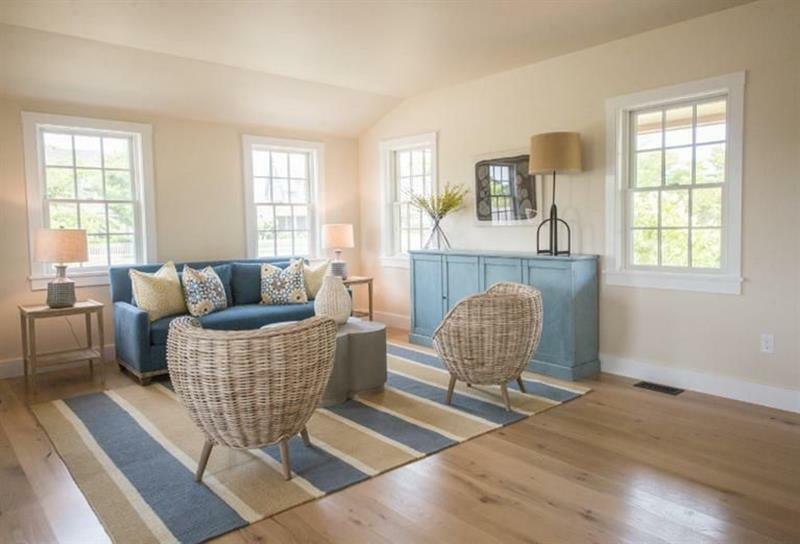 Looking for a charming coastal living room design for inspiration? Well, here it is! 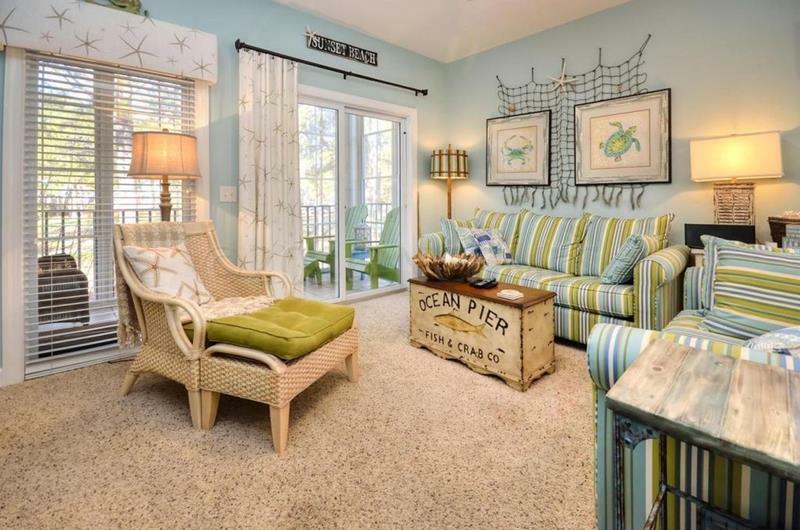 The blue, green and white couches that sit along the outside of the room definitely recall the colors of the beach. However, it’s the small touches that really create the vibe for this small living room! The unique coffee table is just right, and the comfortable wicker chair aligned along the back of the room really sends the style’s message home. Accent walls are something that can really help to define any living space, especially a small living room. Here, you can see the multi-colored wood wall that’s at the back of this design. Everything else in the space really maximizes on the vibe that this accent wall creates. The dark blue media center is definitely cool, but the orange L-shaped couch is definitely the furniture piece that most defines this design. This small living room is built into an open concept home. First, take a look at the color scheme that’s established by the wall color, hardwood floors and the built-in shelves. 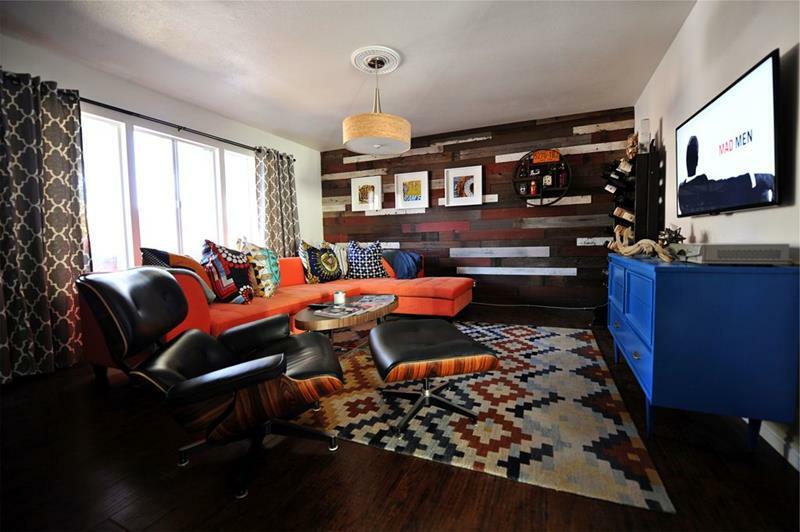 Then take a look at the furniture that’s been used in this small living room. The tufted blue couch perfectly complements the blue built-ins, while the gold and white throw pillows mirror color choices made elsewhere in the space. As mentioned already, a cream (or white) and black color scheme is going to instantly create a sense of luxury. However, such a design can also feel a bit bland. Because of this, you want to make a bold statement with at least one piece in your living room design. Here, that bold statement is the scale that sits a top a monolithic and contemporary wooden coffee table. 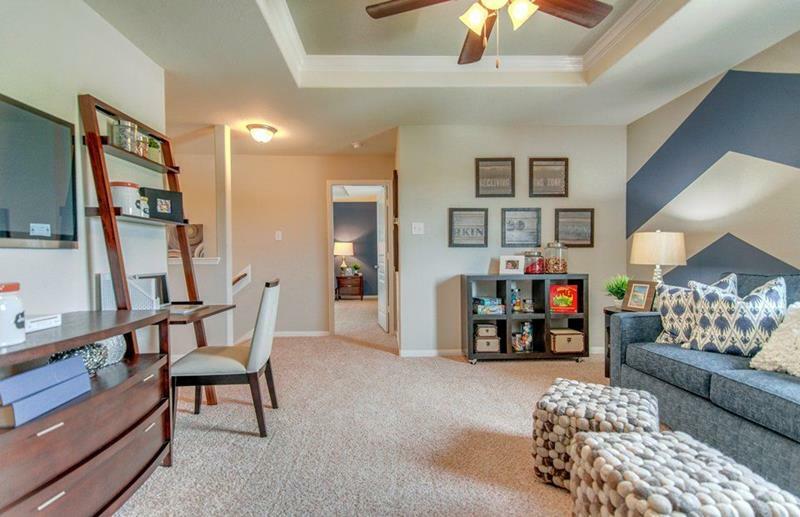 Not only is this small living room attractive, it’s also incredibly comfortable. For some, designing a beautiful living room will involve creating a space that feels like it’s truly a part of the family. For that reason, some may wish to incorporate pictures of friends, family or even children. Here, you’ve got a small living room that does just this without feeling cluttered. This is accomplished thanks to the large photograph that’s been positioned right over the living room’s fireplace. 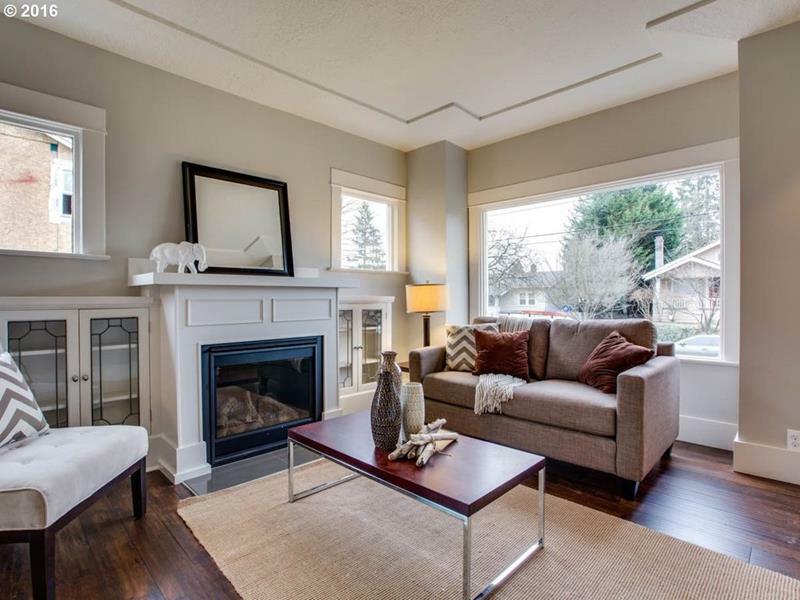 Let’s face it; if you have a small living room, then you likely have a small home to begin with. Because of this, you’ll likely have to design around the peculiar quirks of your home. Here, you’ve got a living room that is home to the stairs leading up to the second floor. Note how the furniture is arranged to allow easy passage to those stairs, all while at the same time not creating a space that feels like a hallway between one place and another. You don’t have to do a lot with a small living room, especially if the room itself is an attractive space. Here, you have an example of a living room that features wonderful contemporary styling and that makes the most of it thanks to its design choices. Low profile furniture helps to preserve that wonderful sense of openness, all while a simple red accent chair makes adds a great degree of spark. In smaller spaces, the temptation is almost always to align the furniture along the walls in order to preserve open floor space. This isn’t always the best thing to do, though. Check out this example! By floating the furniture in the middle of the space, there’s a wonderful sense of intimacy created. 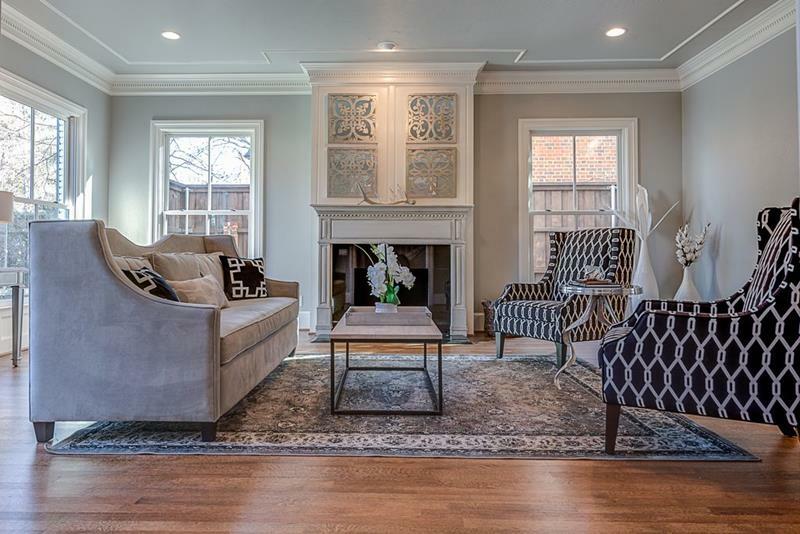 Beyond that, note how the fabric patterns are perfect complements to the cabinetry above the fireplace. The temptation, also, with small living rooms can also be to pile all of the furniture right on top of the fireplace. That’s not always a good idea, though. Check out how this example does a great job of feeling comfortable and intimate while also preserving floor space. A great reading chair provides all that you need for someone that really wants to snuggle up right next to the fireplace while enjoying the living room. Rather than creating a small living room that fits into the overall design style of an open-concept home, remember that you can create living room that’s decidedly his own. Here, everything is built on top of that blue and white area rug with unique pattern. From there, though, a bright green ottoman adds even more visual contrast, while the red throw pillows on the couch blend things in a little bit. Here, the main furniture piece is the antique blue cabinet along the back wall. From there, the design of this coastal small living room beings to take shape. 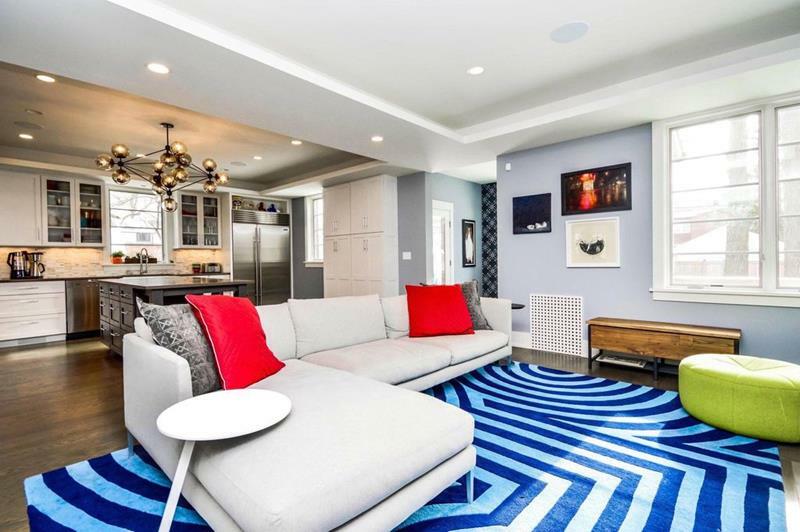 The blue couch is obvious, but what’s great is the blue and gold striped area rug underneath. This provides the perfect canvas upon which the wonderful wicker chairs can be incorporated. In a small home, sometimes rooms have to pull double duty. If you need space for a small home office where you live, you might be looking toward your living room. Here you see a great way that this can be accomplished without things feeling like there’s an office space in your living room. This simple cross between a leaning bookshelf and a desk is a great complement to the cream and blue of the space. Small living rooms, especially one that’s as small as this example, can feel a bit too matchy-matchy after they’ve been designed. Check out how the bit of décor next to the chair at left helps to knock this matchy-matchy feel off kilter. In addition, check out how the dark brown of the chair and the couch add a great degree of contrast to the brownish-grey walls. With a plush area rug underneath, everything is just right! Just because there’s not a lot of floor space in your living room, that doesn’t mean there isn’t necessarily a lot of vertical space. Just as with a large living room, you need to think about how you’re going to fill out that vertical space in these situations. With the tapered top of the fireplace drawing the eye upward here, the hanging wrought-iron chandelier is the perfect way of filling things out here. Here you’ve got a living room in an urban home. As always, you want to make the most of whatever natural light you can get in these kinds of home! Because of this, the small living room design doesn’t obscure the bay windows. 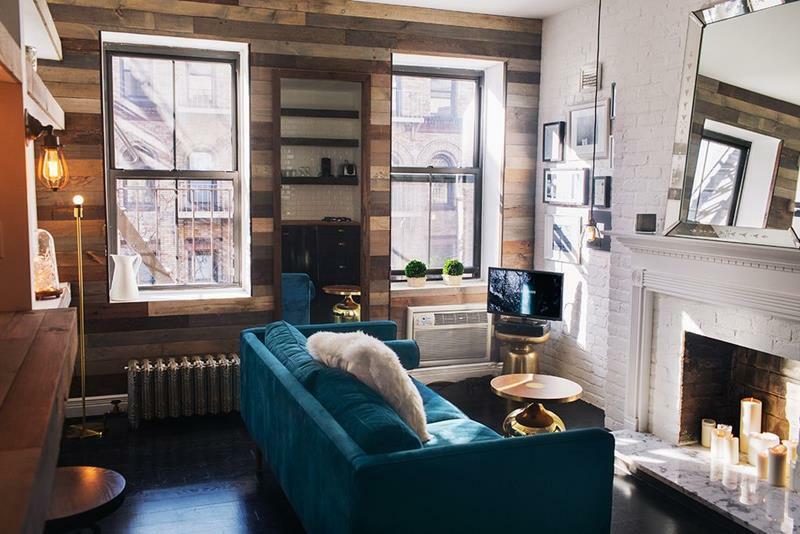 Instead, a bar cart is place beneath the windows, while the couch lies along the wall at right. This allows for enjoyment of the natural light and the fireplace at the same time. That’s perfect! 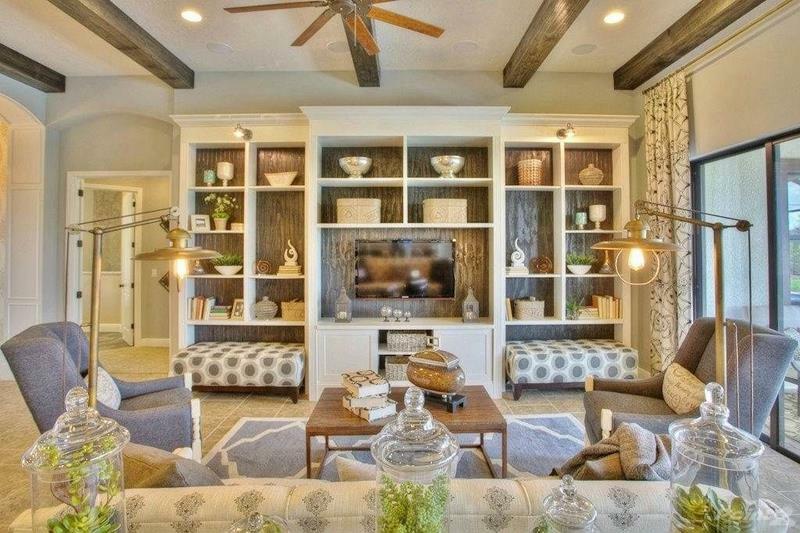 There’s no mistaking the domino and tic-tac-toe styling of this living room! But, where does it begin? If you ask us, it starts with the black and white striped accent wall that’s along the back of this small living room design. From there, the décor can take shape. Note, however, that what really drives the entire contemporary look of this space home is the white furniture with subtle black lines. Even if your living room is exceptionally small, there are many ways that you can get it to pull double duty. Check out this tremendous example. With the couch along the back wall and facing the fireplace, you know that you’ve got an intimate place to sit down and relax. 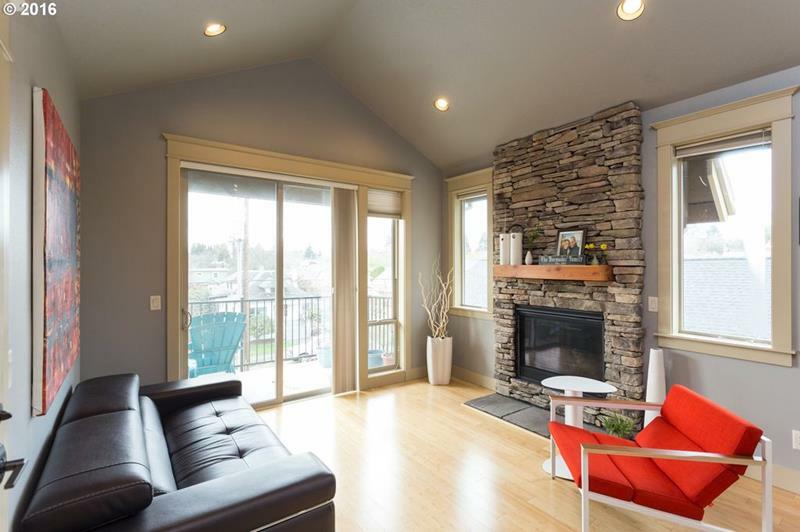 But check out the seating area next to the window and beside the fireplace. Isn’t the a great place to have your morning cup of coffee or to enjoy a good book? With a smaller living room space, you have to find ways of creating storage space. Here two simple wicker ottomans that also offer storage accomplish this. The wicker is a perfect material choice for the space, as it contributes to the light and airy feel that’s established by the yellow and white color scheme. The accent table alongside the one chair is also a deft design choice. Its slim profile keeps it from feeling like clutter. 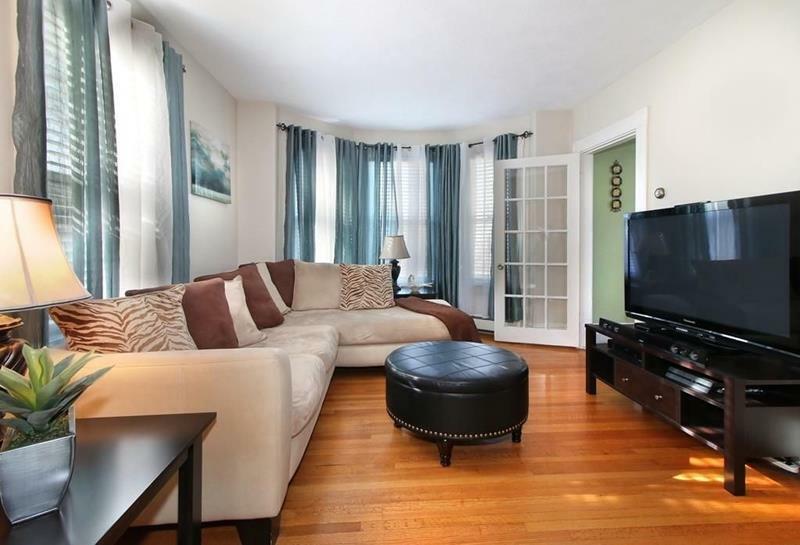 With dark hardwoods underfoot, the main walls of this small living room are lighter but richly stained wood. 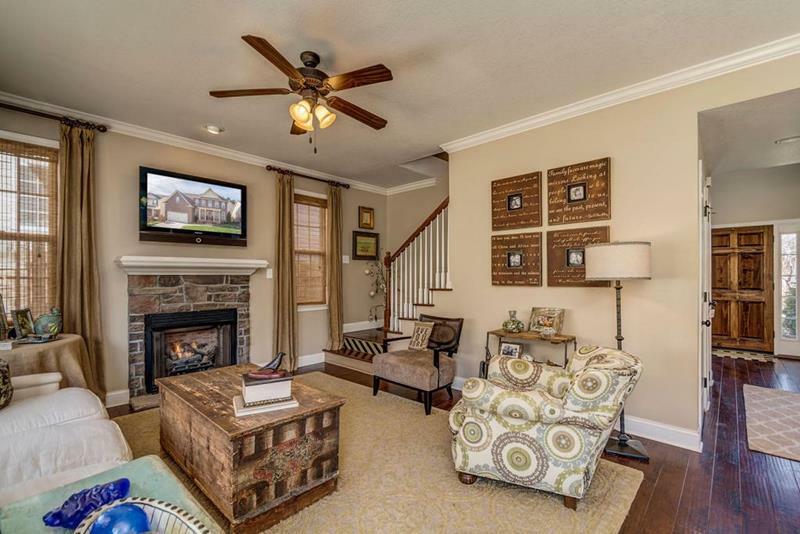 All of this is the perfect complement to the white brick accent wall that frames the central fireplace. As you might expect, a mirror has been incorporated to make this tiny space feel grander. Ultimately, though, it’s the bold and blue couch that really helps to define the look. In a small living room, you’re definitely going to need that one furniture piece that really makes a statement. Here it’s the gorgeous wood coffee table with the square, curved-in legs. Color-wise, it’s the perfect complement to the bright and creamy walls with white accents. The inclusion of a simple vase with flowers is the perfect choice, adding just the right amount of whimsy to the design. 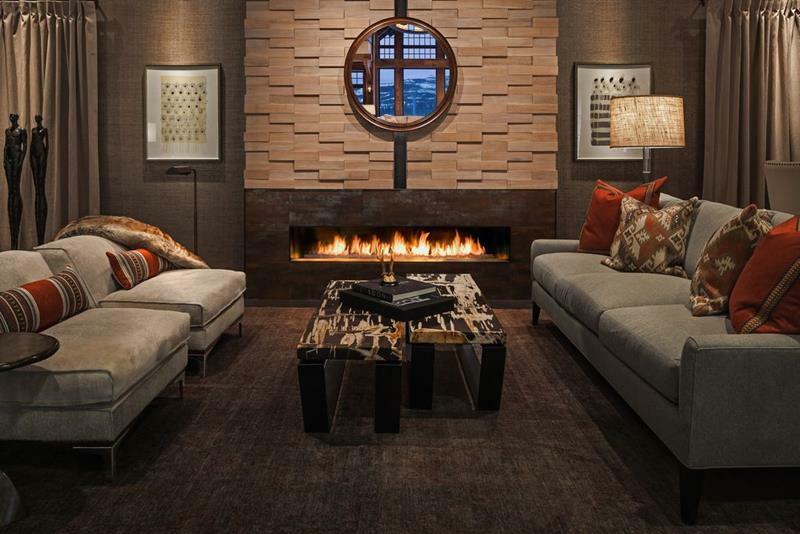 When you’re designing a living room, you’re typically thinking that a coach is a given. However, you don’t have to include a couch in your design. Instead, you can use chairs, which will definitely help to preserve that sense of openness. When combined with a built-in shelving unit, like the one you see at right, you end up with a small living room design that feels at once unique and contemporary. 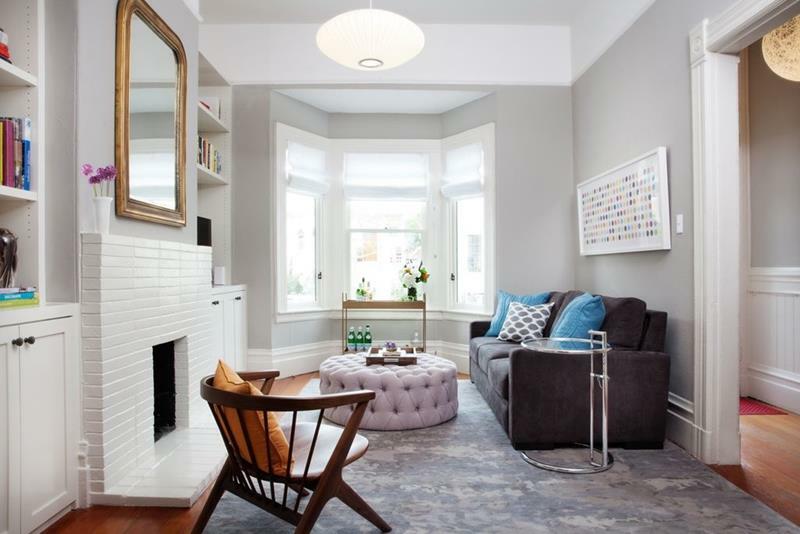 Here’s a small living room design that proves that sometimes less is more. With an L-shaped couch centered around a matching ottoman, there’s plenty of space for family and friends to sprawl out. By centering the furniture in the middle of the space, the living room manages to maintain a sense of airiness. But, what really helps to define the look is the leaning mirror, which you can see at right. When trying to get the most out of a small living room space, you often need to think about how different elements can be used in different ways. Take this living room, for example. Instead of using a coffee table, you have two small ottomans. When not in use, they can form the center of the space. However, they can just as easily be moved to provide comfort to anyone who’s sitting in the space. This homeowner has managed to build both a dining room and a small living room into the same space. 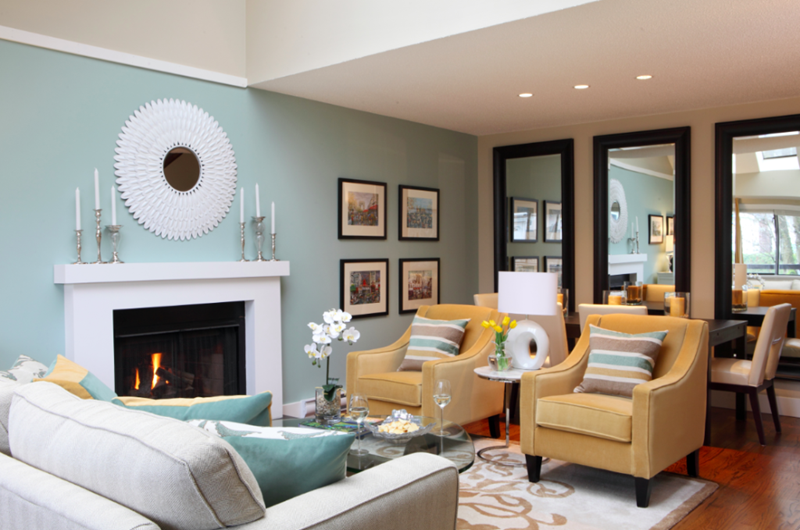 It’s done elegantly, with the three mirrors along the back wall making the space feel larger and more inviting. Note the color scheme of the furniture here, too. The two yellow chairs help to form a division between the two spaces, with the white couch in the foreground anchoring everything. When space is really at a premium, you definitely need to start thinking of some inventive solutions. Here you have an absolutely tiny living room design that features a built-in couch of all things. This may seem like a “cheap” thing, but note how contemporary the look is. 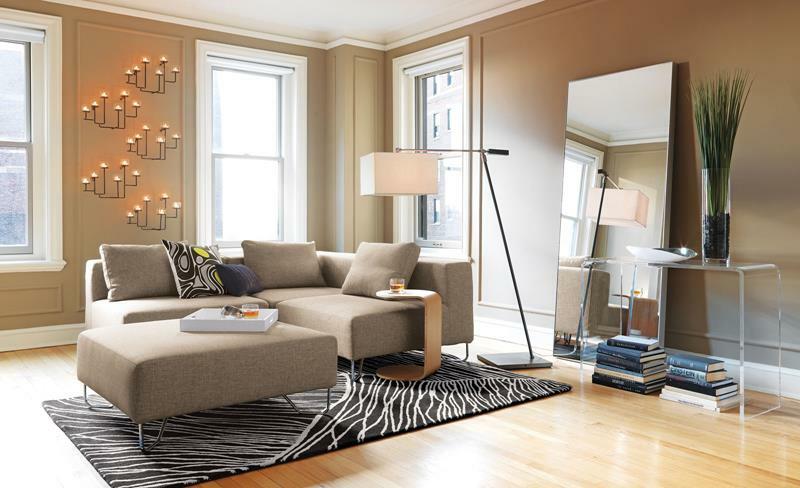 With two simple tables forming the “coffee table” of this space, you feel like its at once comfortable and adaptable. Throughout all of these examples, you’ve seen how savvy design choices can help to make a small living room feel like a grand space. Remember that it’s ultimately about creating a space that feels like home. In this example, you see many of the principles already outlined, as well as other touches that add a sense of home-like atmosphere to the space. Most notably, you have the floating shelves at right.